Home » Style Blog » 6-18-18 THIS WEEK: Reveal or Conceal? 6-18-18 THIS WEEK: Reveal or Conceal? There it was. A message I needed to read, and more importantly, to believe in. This message was a reminder to me to find "balance" in all aspects of my life. This week, together we will use this timely reminder to find balance with our clothes and our accessories. Do you sometimes wonder how things come to you at just the right moment? I'm not sure how it happens, but when it does, I call it providence. 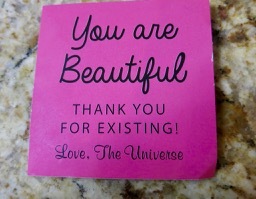 This message (actually it's a sticker) was left on the countertop in my gym's locker room. It was left there intentionally to share with others who need it. Reading its message made me smile (and reflect about) how despite everything (my week having been particularly hectic) that we all have something special to offer the world. It's up to us to let our light shine. This message helped me hit my "reset button" inside my head. Yes girl, reset that attitude of yours! That's what I told myself. All is good with the world, so stop...BREATHE and appreciate this moment-ahhhh, EXHALE. Sometimes life gets off kilter or out-of-sorts. That's when we have to pause and hit reset. Let's hit the "reset" button with our wardrobes this week. Let's work on finding those few items that really balance and flatter our shape. Humans are naturally attracted to balance. As we continually seek out equilibrium, we are also naturally drawn to symmetry. Studies have shown, the human eye gravitates towards symmetrical objects (whether they are part of a landscape or the shape of another person's face). Symmetry is visual balance. Do you consider "symmetry" when you dress? How do you know? Well, that's something we'll discuss this week. Symmetry is a beautiful thing-and so are you! When your outfit is balanced, it looks proportional, and we're attracted to this pleasing look of symmetry. It is also why some face and body shapes can be considered more attractive than others. Learn this week how to work with what you've got to increase your own symmetry-it's fascinating how it works! Adjusting your body's proportions can help you create a balanced silhouette every time you dress. I call this technique "Conceal & Reveal" strategies. It's about taking from one area, while adding to another area of the body to create a balanced shape-to get the symmetry you want. This week at MSP...learn how to create a balanced look by using "Conceal & Reveal" strategies"
This works for every woman! Just select the body part & follow the instructions! Get "Conceal & Reveal Strategies" when you order your MSP Personal Profile today! Make friends with your tailor! Take at least one item to your local tailor and have it altered. Why do we expect "ready-to-wear" clothes straight off the rack to fit us perfectly? With each of us so different in size, shape and height...Alterations are the only way to have the fit you deserve! We all have unique curves. Some of us have a fuller bust, some of us have a full booty, while others have a little extra in the middle. Since we are all a bit different (even if we wear the same size) the fit of our clothes might be close, but not quite right. You deserve clothes that fit right! A good fit can make even a low-priced item look polished and expensive. Don’t be afraid to get items tailored, even if they were cheap in the first place. For a few dollars, a tailor can transform the most inexpensive item into a custom fitted piece just for you. I am a new syster and recently got a compliment from a co-worker who is quite stylish herself. I follow your advice and guess what happened? It worked! She told me what a cute jacket I had and how great I looked. (I followed what YOU recently said about the right jacket) I am happy with my “makeover”. I've been a "syster" for about 6 months now and what a difference! I'm a petite "A" that used to wear black and brown and wore clothes too loose for me! Now I am wearing the right colors (Yay for seasonal colors!) and the right cuts for my body type! Today a young mom complimented me and said that every time she sees me I am always put together and look nice! :o) I wore a pencil skirt, a nice tank under a sunshine yellow cardigan, a pearl beaded bracelet, and sandals (and of course light make-up).